James Savage, A Genealogical Dictionary or The first Settlers of New England showing Three Generations or Those who came Before May, 1692 on the Basis of Farmer's Register, (1862) , Vol. 3. p 409. Phillips genealogies, , at https://archive.org/stream/phillipsgenealog00phil . Auburn, Mass, Worcester, Mass: Press of C. Hamilton, (1885) , p. 189. 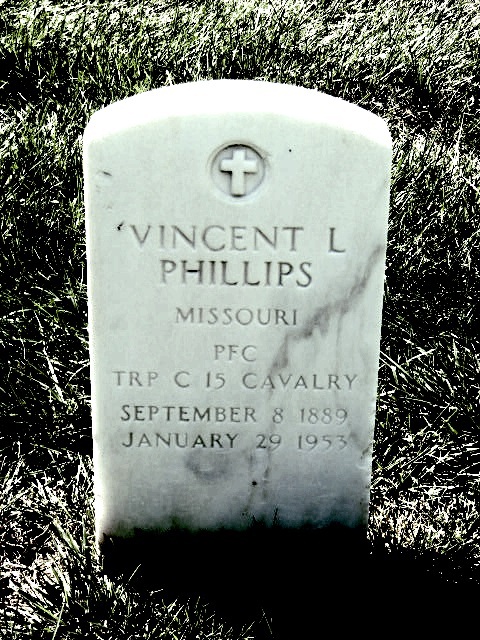 Phillips genealogies, , at https://archive.org/stream/phillipsgenealog00phil . Auburn, Mass, Worcester, Mass: Press of C. Hamilton, (1885) , p. 190. 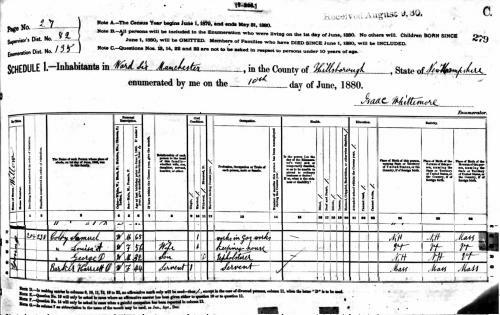 "United States Census, 1930", database with images, FamilySearch (https://familysearch.org/ark:/61903/1:1:XHXH-96V : 8 December 2015), Vincent L Phillips, 1930. "United States Census, 1940," database with images, FamilySearch (https://familysearch.org/ark:/61903/1:1:K73J-Y5W : accessed 19 December 2016), Leonard Phillips, Ward 5, St. Joseph, Washington Township, Buchanan, Missouri, United States; citing enumeration district (ED) 11-40, sheet 3B, line 59, family 104, Sixteenth Census of the United States, 1940, NARA digital publication T627. Records of the Bureau of the Census, 1790 - 2007, RG 29. Washington, D.C.: National Archives and Records Administration, 2012, roll 2088.
living at Young Street, Manchester, Hillsborough County, New Hampshire. "New Hampshire, Death Records, 1654-1947," database with images, FamilySearch (https://familysearch.org/ark:/61903/1:1:FSKJ-KLZ : accessed 28 August 2015), Louisa A Colby, 07 Mar 1887; citing Chester, Bureau Vital Records and Health Statistics, Concord; FHL microfilm 1,001,068. Harrison Colby, A genealogy of the descendants of Abraham Colby and Elizabeth Blaisdell, his wife, who settled in Bow in 1768, , at https://archive.org/details/genealogyofdesce00colb . Concord, N.H.: Printed by the Republican Press Association, (1895) Microfilm #896944 of the Family History Library, Salt Lake City, Utah, p. 123. "New Hampshire, Marriage Records, 1637-1947," index and images, FamilySearch (https://familysearch.org/pal:/MM9.1.1/FLXF-1VF : accessed 29 Oct 2012), Samuel Colby and Louisa A. Philips and null, 1841. 1880 United States. Census Office. 10th census, 1880 federal population census, Washington, District of Columbia: National Archives and Records Service, ([19--]) , Census Place: Manchester, Hillsborough, New Hampshire; Roll: 763; Family History Film: 1254763; Page: 279C; Enumeration District: 135; Image: 0559. Irving A. J. Colby & Clara L. Hale, Copy of Record of Marriage Vol. 255, p. 12, #203 (1878), The Massachusetts Archives at Columbia Point, 220 Morrissey Boulevard, Boston, Massachusetts. Harrison Colby, A genealogy of the descendants of Abraham Colby and Elizabeth Blaisdell, his wife, who settled in Bow in 1768, , at https://archive.org/details/genealogyofdesce00colb . Concord, N.H.: Printed by the Republican Press Association, (1895) Microfilm #896944 of the Family History Library, Salt Lake City, Utah, p. 122. Lydia Phillips was born perhaps about 1721. Seth C. Cary, John Cary, the Plymouth Pilgrim (n.p. : Seth C. Cary, Dorchester Center, Boston, MA, 1911, unknown publish date), p. 92. Sec. 36. Seth C. Cary, John Cary, the Plymouth Pilgrim, p. 92, section 36. Thomas W. Baldwin, Vital Records of Wrentham, Massachusetts, to the Year 1850, Boston, Mass. : Stanhope Press, (1910) , Vol. 2, p. 256. Thomas W. Baldwin, Vital Records of Wrentham, Massachusetts, to the Year 1850, Boston, Mass. : Stanhope Press, (1910) , Vol. 2, p. 415. Thomas W. Baldwin, Vital Records of Wrentham, Massachusetts, to the Year 1850, Boston, Mass. : Stanhope Press, (1910) , Vol. 1, p. 30. Thomas W. Baldwin, Vital Records of Wrentham, Massachusetts, to the Year 1850, Boston, Mass. : Stanhope Press, (1910) , Vol. 1, p. 29. 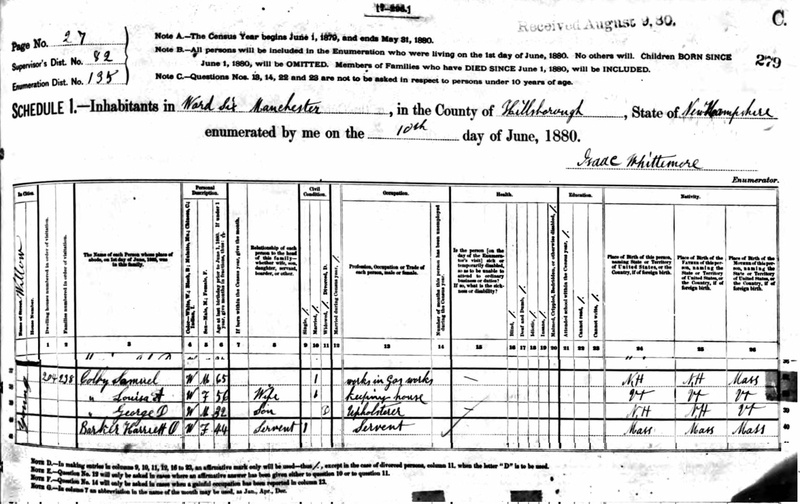 Thomas W. Baldwin, Vital Records of Wrentham, Massachusetts, to the Year 1850, Boston, Mass. : Stanhope Press, (1910) , Vol. 1, p. 31. Thomas W. Baldwin, Vital Records of Wrentham, Massachusetts, to the Year 1850, Boston, Mass. : Stanhope Press, (1910) , Vol. 1, p. 24. Thomas W. Baldwin, Vital Records of Wrentham, Massachusetts, to the Year 1850, Boston, Mass. : Stanhope Press, (1910) , Vol. 1, p. 28. James Savage, A Genealogical Dictionary or The first Settlers of New England showing Three Generations or Those who came Before May, 1692 on the Basis of Farmer's Register, (1862) , vol. 3, p. 409. Richard Phillips was born perhaps about 1790. Seth C. Cary, John Cary, the Plymouth pilgrim, , at https://books.google.com/books?id=oDgcAAAAYAAJ . Boston, Massachusetts: (1911) , p. 165. Seth C. Cary, John Cary, the Plymouth pilgrim, Boston, Massachusetts: (1911) , p. 166. A RESIDENT OF CITY FOR 65 YEARS DIES, Leavenworth Times, Leavenworth, Kansas, August 26, 1938. "United States Census, 1940," database with images, FamilySearch (https://familysearch.org/ark:/61903/1:1:K73V-VFL : accessed 29 September 2016), Vincent L Phillips, Ward 7, St. Joseph, Washington Township, Buchanan, Missouri, United States; citing enumeration district (ED) 11-56, sheet 7A, family 134, Sixteenth Census of the United States, 1940, NARA digital publication T627. Records of the Bureau of the Census, 1790 - 2007, RG 29. Washington, D.C.: National Archives and Records Administration, 2012, roll 2088. "New Hampshire Marriage Records, 1637-1947," database with images, FamilySearch (https://familysearch.org/ark:/61903/1:1:FL6K-JPR : 12 December 2014), Alanson Spaulding and Clara M. Philpot, 30 Jul 1866; citing Dover, , New Hampshire, Bureau of Vital Records and Health Statistics, Concord; FHL microfilm 1,001,301. James Savage, A Genealogical Dictionary or The first Settlers of New England showing Three Generations or Those who came Before May, 1692 on the Basis of Farmer's Register, (1862) , vol. 3, p. 417. James Albert Finney, The Name and Family of Finney, , at https://archive.org/stream/clanfinley00stou . Colorado Springs, Colorado: (1953) , pp. 15-16. "Massachusetts Births and Christenings, 1639-1915," database, FamilySearch (https://familysearch.org/ark:/61903/1:1:F45W-Z3T : accessed 29 January 2016), John Morton, 15 Nov 1706; citing Plymouth, Plymouth, Massachusetts, p76; FHL microfilm 416,334. 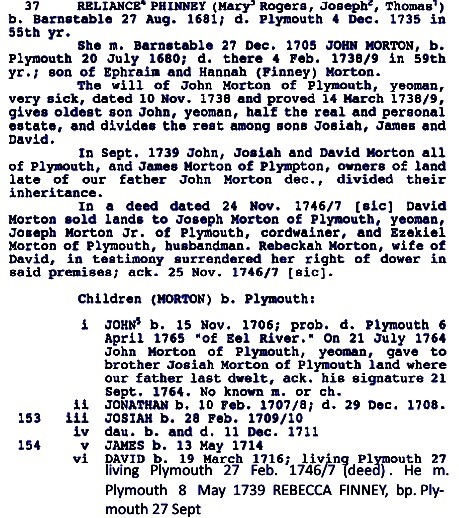 "Massachusetts Births and Christenings, 1639-1915," database, FamilySearch (https://familysearch.org/ark:/61903/1:1:F45W-Z31 : accessed 29 January 2016), Jonathan Morton, 10 Feb 1707; citing Plymouth, Plymouth, Massachusetts, p76; FHL microfilm 416,334. "Massachusetts Births and Christenings, 1639-1915," database, FamilySearch (https://familysearch.org/ark:/61903/1:1:F45W-ZQS : accessed 29 January 2016), Josiah Morton, 28 Feb 1709; citing Plymouth, Plymouth, Massachusetts, p76; FHL microfilm 416,334. "Massachusetts Births and Christenings, 1639-1915," database, FamilySearch (https://familysearch.org/ark:/61903/1:1:F45W-ZQ7 : accessed 29 January 2016), Morton, 11 Dec 1711; citing Plymouth, Plymouth, Massachusetts, p76; FHL microfilm 416,334. "Massachusetts Births and Christenings, 1639-1915," database, FamilySearch (https://familysearch.org/ark:/61903/1:1:F45W-ZQH : accessed 29 January 2016), James Morton, 13 May 1714; citing Plymouth, Plymouth, Massachusetts, p76; FHL microfilm 416,334. 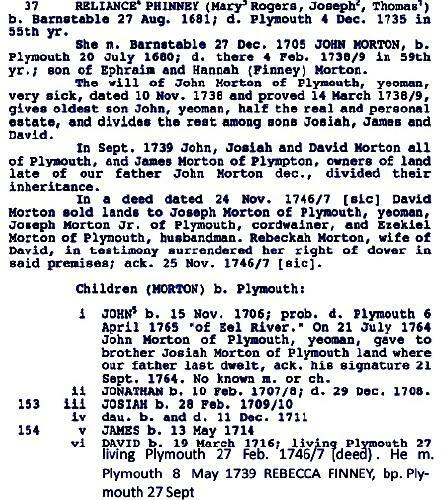 "Massachusetts Births and Christenings, 1639-1915," database, FamilySearch (https://familysearch.org/ark:/61903/1:1:F45W-ZQX : accessed 29 January 2016), David Morton, 19 Mar 1716; citing Plymouth, Plymouth, Massachusetts, p76; FHL microfilm 416,334. James Savage, A Genealogical Dictionary or The first Settlers of New England showing Three Generations or Those who came Before May, 1692 on the Basis of Farmer's Register, (1862) , vol. 3, p. 418.